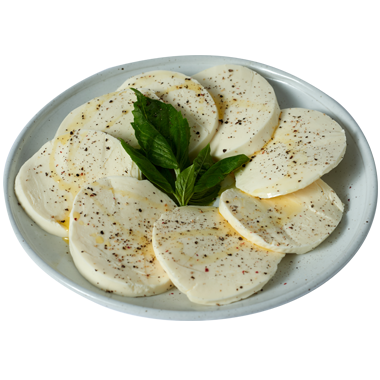 Freshly pulled, water-packed, smooth and fresh mozzarella is a dream of a cheese with a delicate, milky flavor and slightly elastic texture. It’s called mozzarella fresca in Italy where it, of course, originated, and there it’s often made with water buffalo milk. We don’t have many water buffalo in Wisconsin, so we make ours from cow’s milk. Ours is lush and juicy, and we can never get enough of its bright, fresh and uplifting flavor. With no rind to protect it, fresh mozzarella should stay submerged in its water until you eat it. It’s best fresh -- as the name more than implies -- so get to it! We prefer nicely chilled, zesty whites, rosés and sparkling wines with fresh mozzarella like pinot gris, sauvignon blanc, pinot bianco, dry prosecco and moscato d’asti. Light beers are great too like pilsners, lagers and kolsch. Young, fresh summer vegetables, ripe and juicy fruits, just-picked heirloom tomatoes, oven-roasted tomatoes, prosciutto, pasta and pizza are just some of the many foods that go super well with fresh mozzarella. We love it sliced with tomatoes and fresh basil drizzled in extra virgin olive oil and seasoned with sea salt and freshly ground black pepper. Serve it over olive-oil-brushed and toasted baguette with roasted red peppers, grilled eggplant, oil-cured sundried tomatoes or grilled zucchini and all will soon be right with the world.